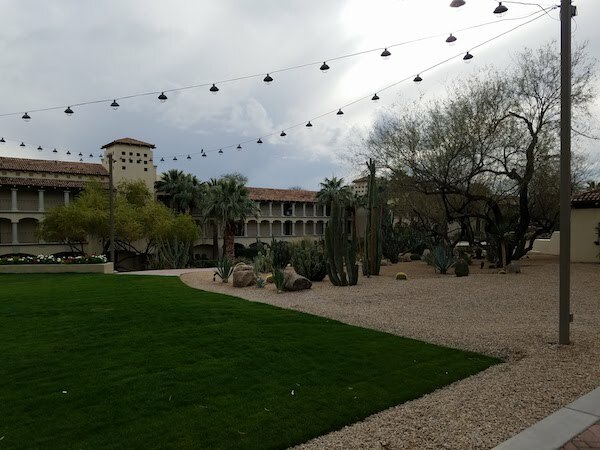 Through the now extinct Chase Fairmont credit card, I was able to accumulate three free nights at a Fairmont property worldwide. 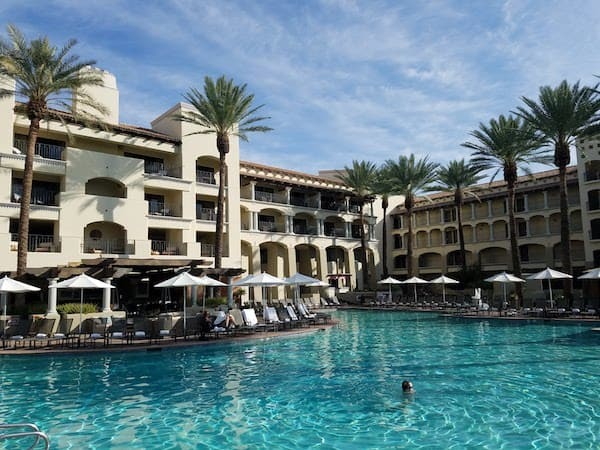 My sister and I decided to go to Scottsdale, Arizona for some sunshine over the three day President’s Day weekend. 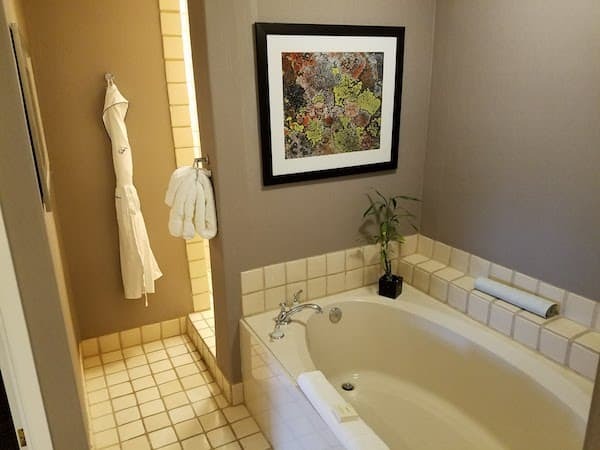 With a phone call I was able to book three free* nights and at the same time apply a suite upgrade to get us a Casita Junior Suite. *As with so many hotels, there is a mandatory $30 daily resort fee even on free nights. 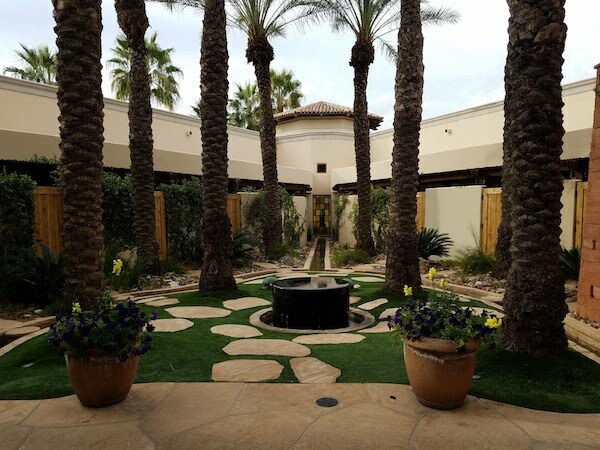 The Fairmont Scottsdale Princess is located in north Scottsdale between Scottsdale Road and Hayden Road on the TPC Scottsdale golf course. 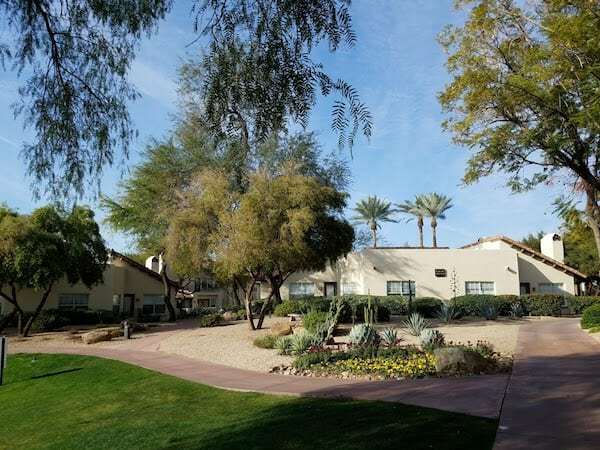 It is a 25 minute drive from PHX Sky Harbor Airport. The property is very easy to access from the Highway 101 Loop. There are plenty of restaurants and shopping options nearby. It is not the most walkable location but if you don’t mind walking along a busy road, you can find what you need. We found that except for going to a CVS for beverages and snacks the first day, we never left the property. 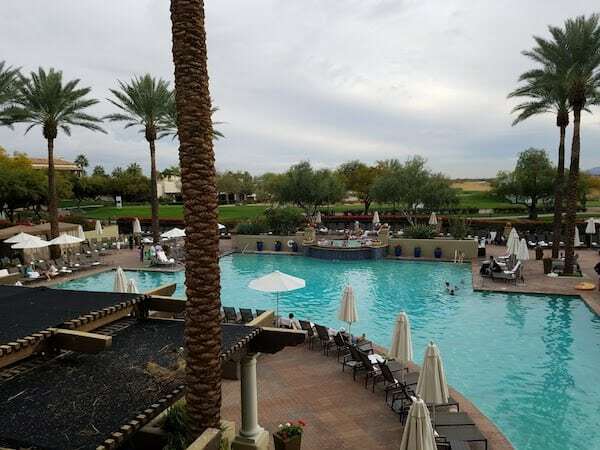 This was my second time visiting Scottsdale; the first time I stayed at the Four Seasons which is located farther north. 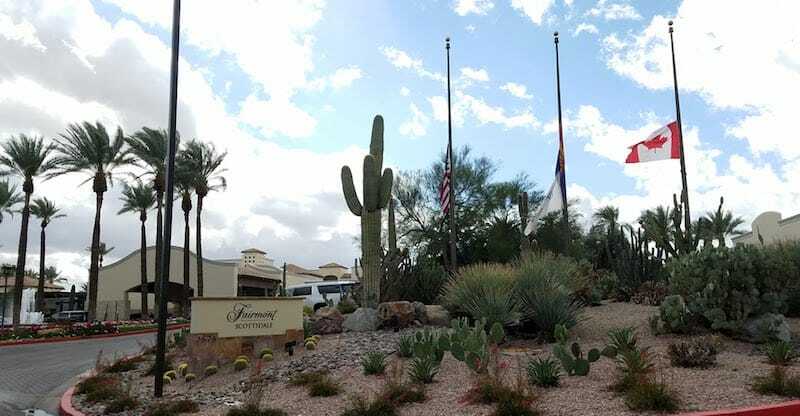 We arrived arrived to the Fairmont Scottsdale Princess property around 2:00pm. Staff greeted us and valeted our rental car while we checked in. Valet parking is complimentary until 10:00pm. For overnight it is $24 or self park for $15. As you enter the lobby, the check in desk is to the left and concierge to the right. There is a line for President’s Club guests (and I’m guessing this will continue when Accor takes over) though it is only staffed by one person and the regular line seemed to go faster. Our room was ready for us (despite check in being at 4:00pm) and the staff showed us all the property amenities on a map. Another staff member then escorted us to a golf cart to take us to our Casita. The property is huge and quite beautiful. 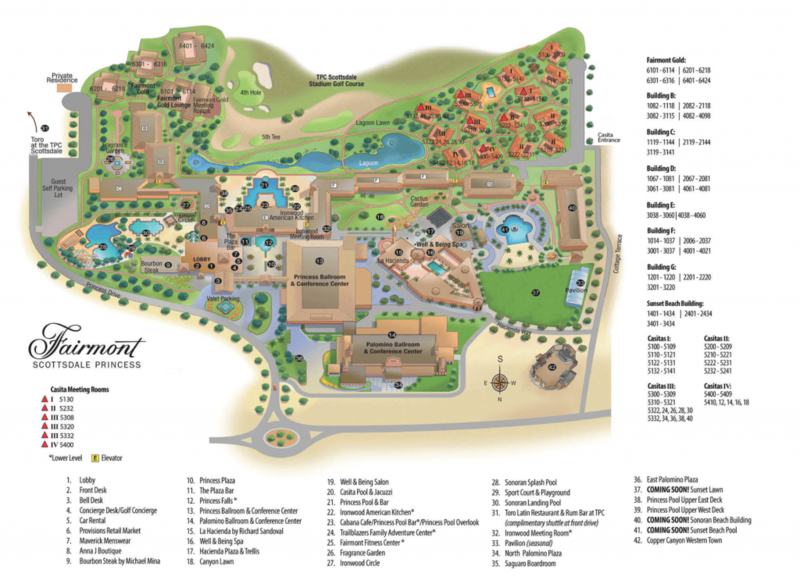 There are a total of 750 guest rooms across the main hotel buildings, casita village, and Fairmont Gold village. Much of the property is taken up by the conference center. There are six pools, three restaurants, a coffee shop, bar, spa, gym, shops and child care center. To download a PDF Map of the property, click here. We were assigned Casita 5110 located in the Casita I cluster. Each cluster has 2 or 4 buildings. Each building has 10 units. 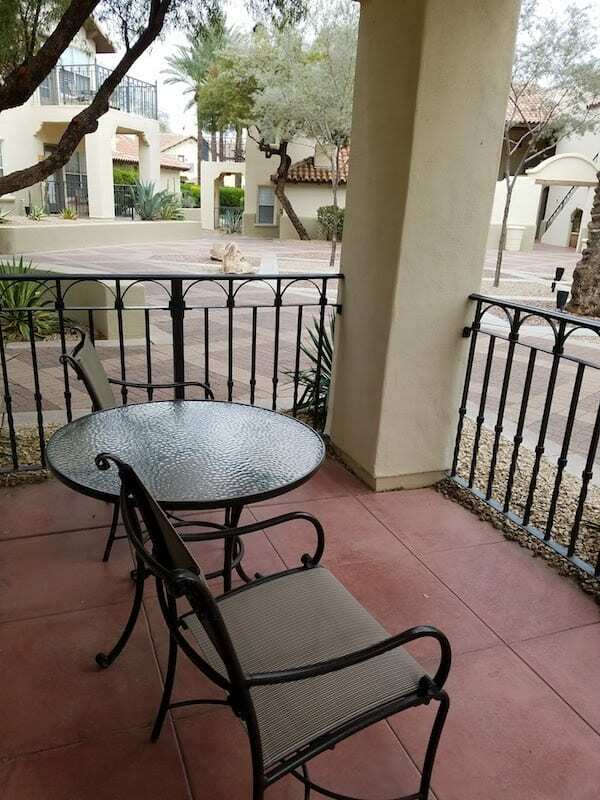 We had a first floor unit at the far corner of the property. 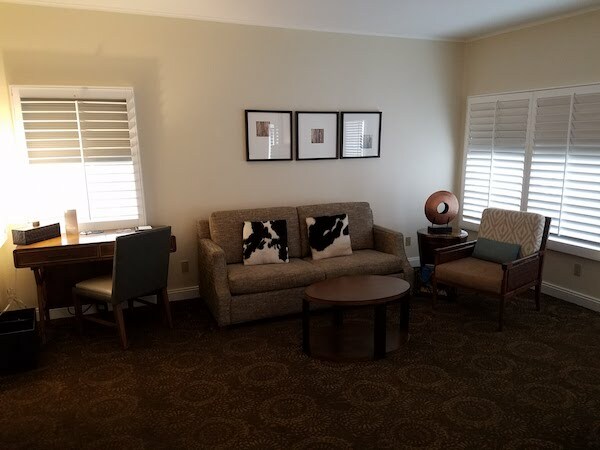 The Casita Junior Suite is essentially one large hotel room. 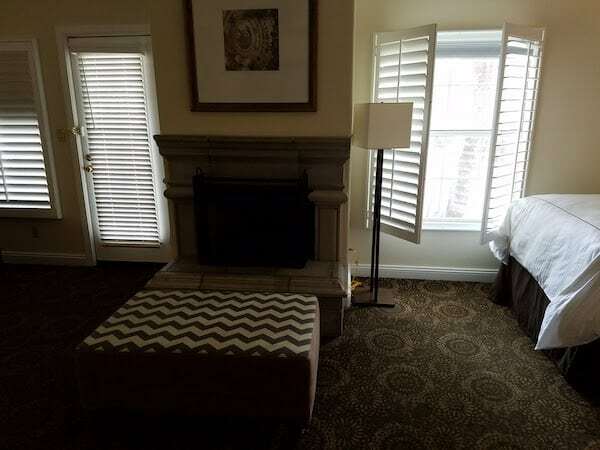 There is a living room area as you first enter and the two beds are on the opposite side. The beds were incredibly comfortable with high end linens. A gas fire place functions as a visual separation between the two areas. 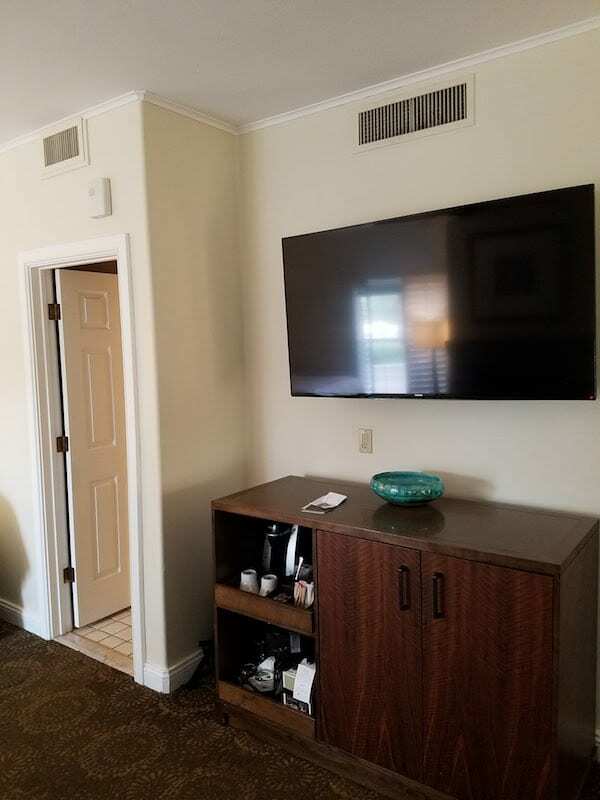 Opposite the fireplace is the TV, mini bar and coffee maker. 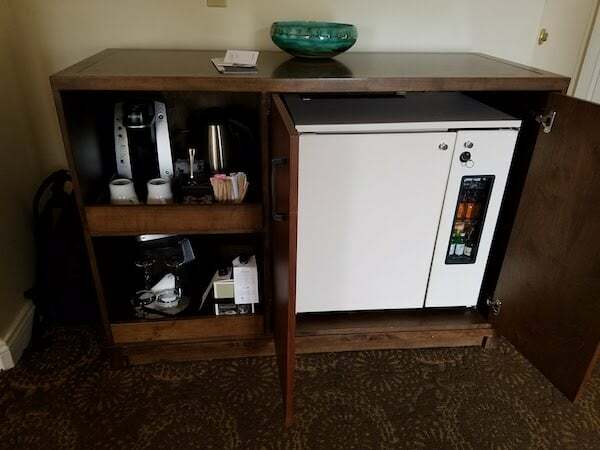 There is no mini fridge and there is no microwave. We ended up using a lot of ice to keep our beverages cool. 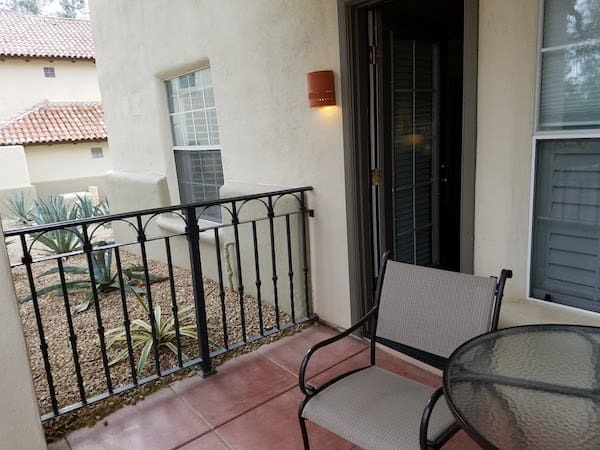 Each Casita either has a patio or balcony. While the Casitas were updated in 2014, there are still parts of the bathroom that look original (and dated). The bathroom is quite large. 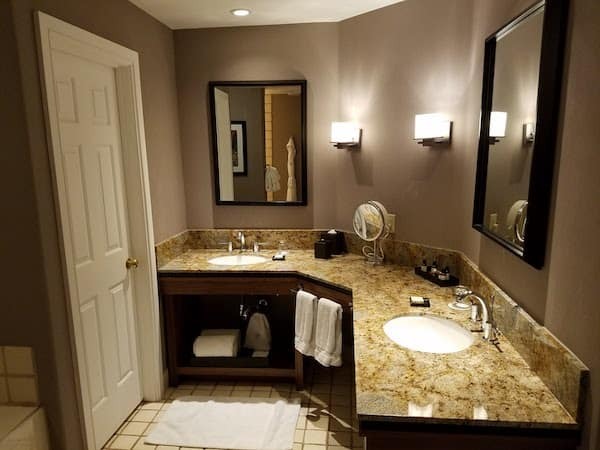 The double vanity has plenty of counter space. 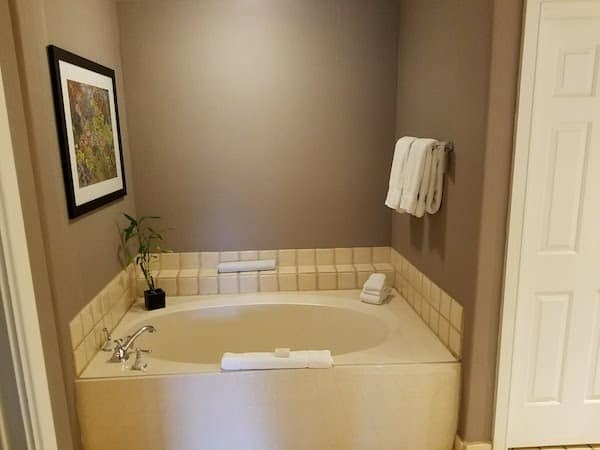 A large soaking tub is in the middle section of the bathroom. 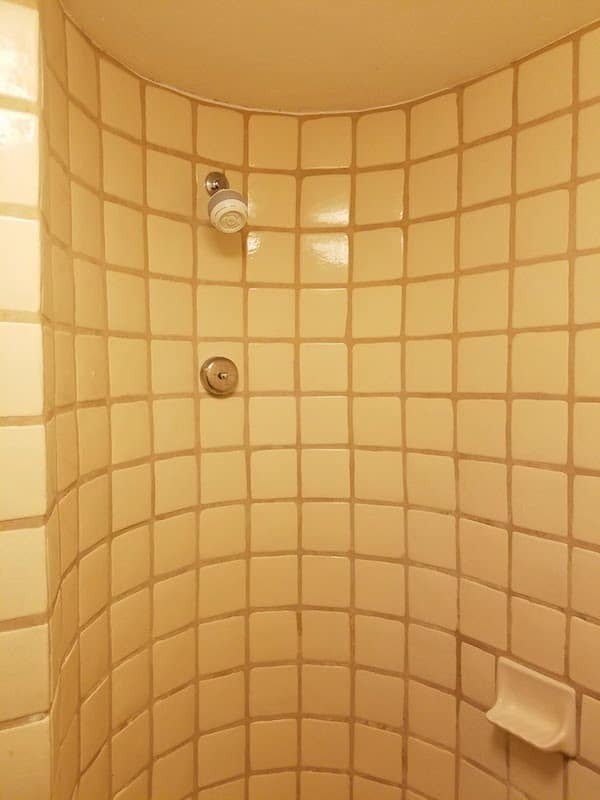 Next to the tub is the large shower. It is essentially a 3/4 circle. There is no door to the shower due to the layout that keeps water from escaping. Unfortunately it is a very basic shower head. They could easily upgrade it to a rain shower and hand held wand to make ti feel more luxurious. My other major complaint with the bathroom is that it smelled bad and was always hot. I don’t know what they were thinking, but the heat is always on in the bathroom and there is no way to change the temperature. It also smelled like sewage. Ick. 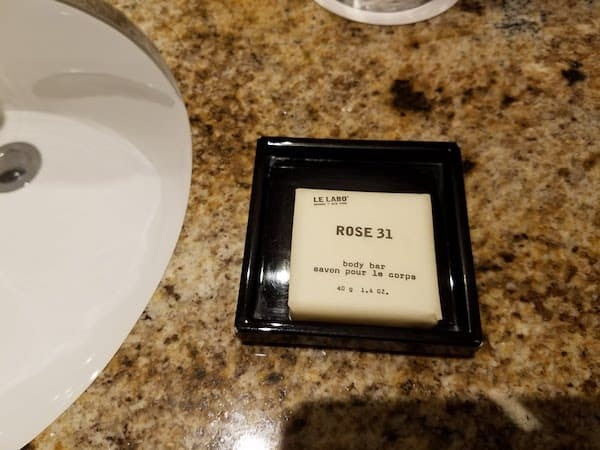 On the bright side, the products were high end Le Labo, the same brand the Park Hyatt Sydney provides. 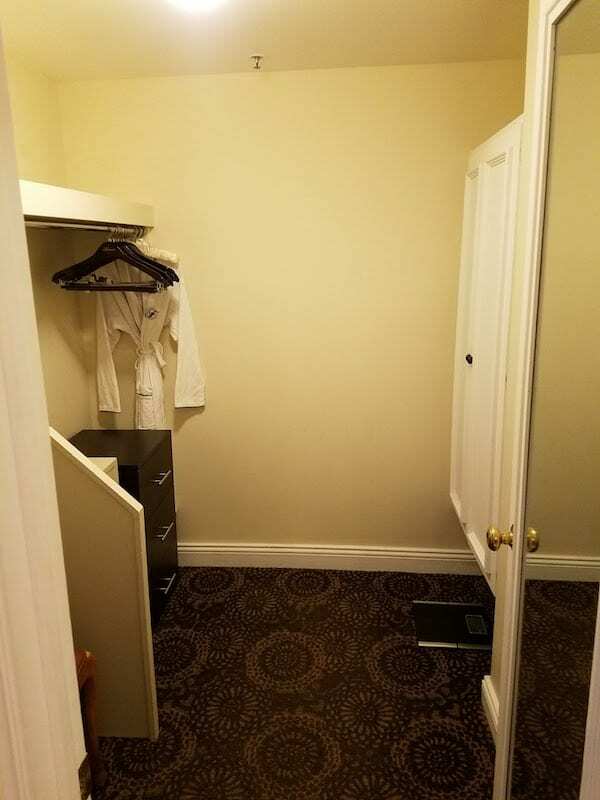 Also in the bathroom is a large walk in closet area with a safe and the only dresser in the unit. And it is strangely small. 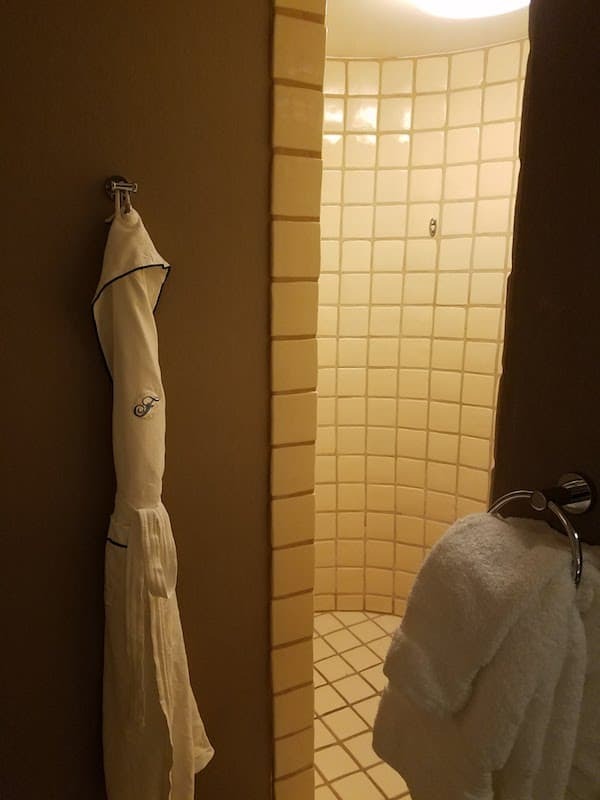 You can see it below the hanging robe. The Fairmont Scottsdale Princess has 6 pools on property. They all offer a slightly different experience. The main pool is the Princess Pool located behind the main building. 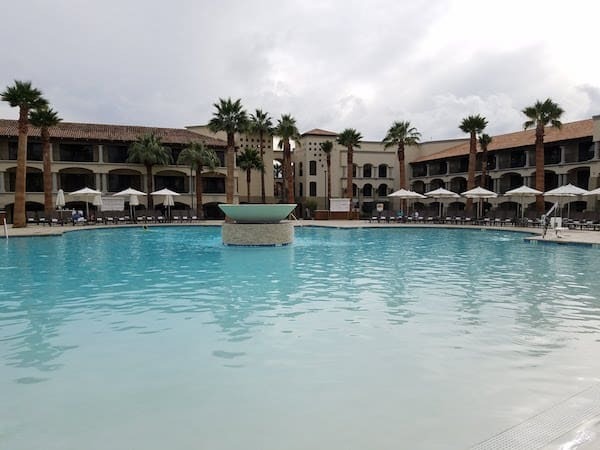 In addition to the large pool there is a hot tub, bar, plenty of lounge chairs, cabanas and lawn games like giant chess and Jenga. The two Sonoran pools are nearby each other. The Splash pool is kid friendly with waterslides while the Landing is adults only. 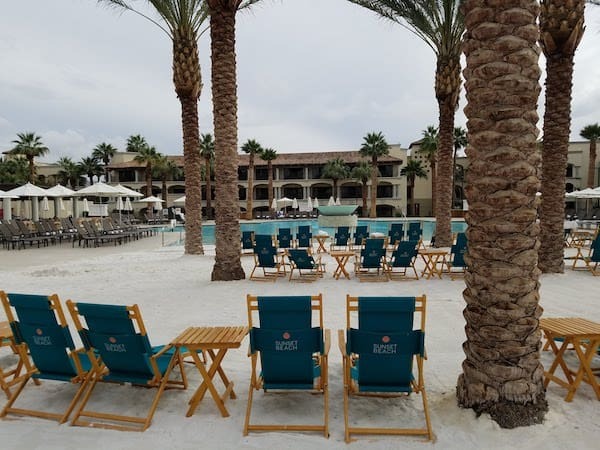 The newest pool is the Sunset Beach pool that offers a beach theme with a sandy area for guests to enjoy. There is a small pool and tiny hot tub located near the Casitas. I enjoyed the area at night as it has a large number of outdoor seating and fire pits. The final pool is the second adults only pool located on the roof of the spa facilities. 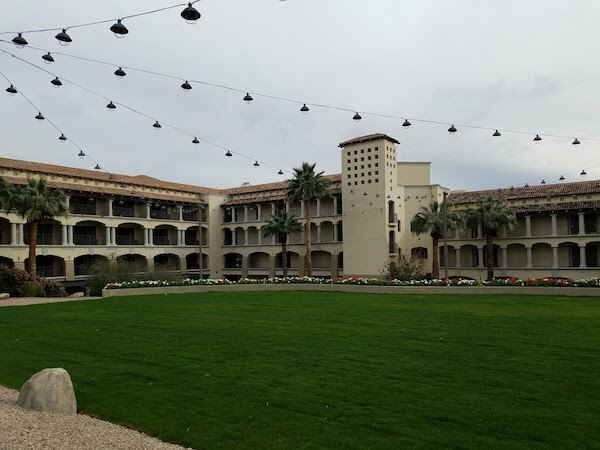 The spa is a huge complex in the middle of the property. Use of the spa facilities is included with a spa treatment (massage) or by paying a daily spa use fee that is $27 per person. 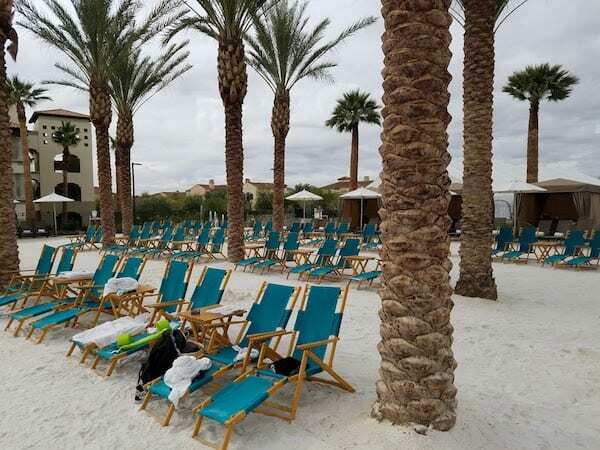 This is in addition to the mandatory $30 per day per room resort fee. 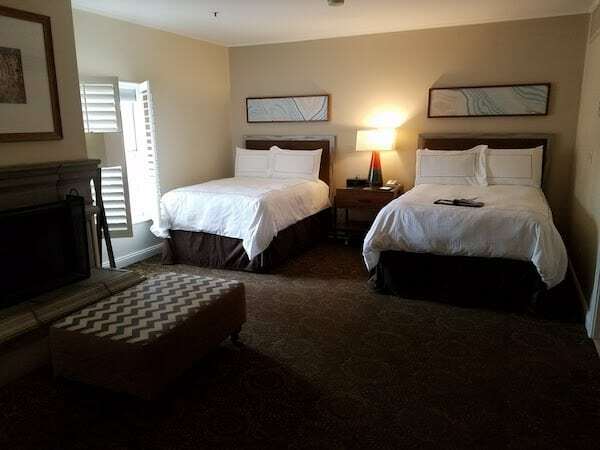 If there are two of you visiting the property, this means that in order to use all the facilities of the property, you will be paying $80+ in addition to the nightly room rate. The cost, in my experience, was worth it. 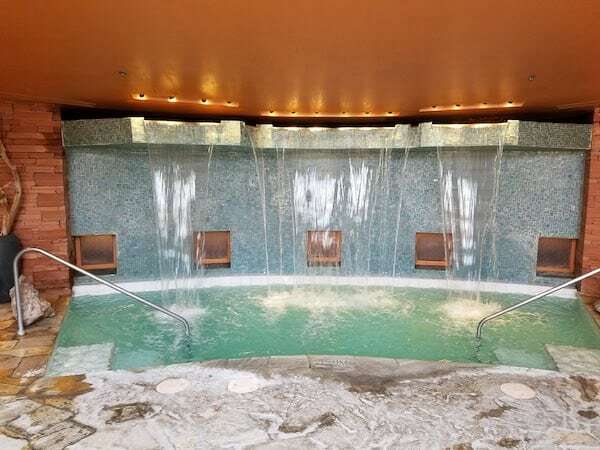 With a day pass you have access to the workout studio classes, gym, the adult pool, and the spa facilities that include a grotto style hot tub and gender divided facilities that include hot and cold tubs, steam room, sauna, aromatherapy room and other standard spa amenities. Treatments are additional costs. 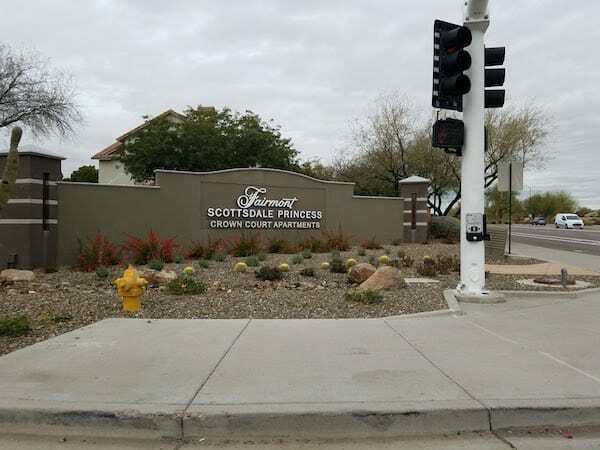 If you don’t want to pay the spa fee, you can use a second, smaller gym by the Princess Pool that is included with the resort fee. There are a number of restaurants on site. Most of the pools offer food and drink service as well. The fanciest restaurant is Bourbon Steak (by Michael Mina) located just off the lobby. Just behind the lobby is the Plaza Bar which offers outside seating for drinks and casual bites. Ironwood American Kitchen is your more casual but still full service dining. We ate twice at La Hacienda (by Richard Sandoval) and found it excellent. They have a huge selection of Tequila and offer the expertise of an in house “Tequila Goddess” who is very happy to share her knowledge. The guacamole is made table side and is delicious. The prices are moderate to high. Toro Rum Bar is actually located in the golf course club house and is located about 1/2 mile away from the hotel. They offer a free shuttle or you can walk it if you want. It is the only restaurant “on site” with a happy hour. It was okay but we found La Hacienda to be a better option. Honestly we found the service to be a bit spotty. There were a lot of staff on site, but often we saw them sitting in the golf carts waiting for guests to ask for a ride. Other times when we actually needed help, staff were no where to be seen. The front desk staff were on top of it. They were friendly and knowledgable. As were the large number of staff out front at the valet station. Housekeeping typically didn’t come until 4 or 5pm. 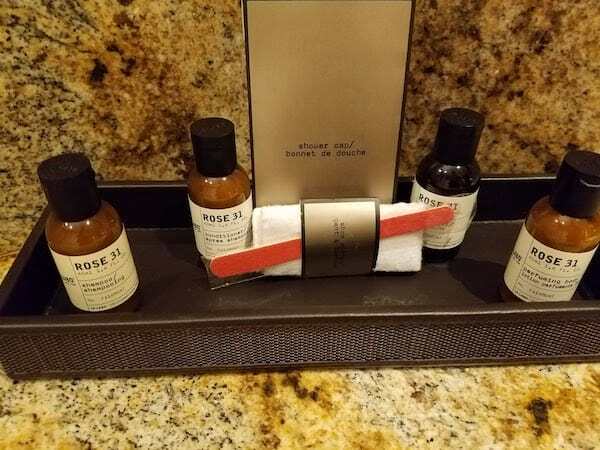 However they did a very thorough job when they finally did come and returned shortly thereafter for turn down service. Katie, the Tequila Goddess, was awesome. She spent a good 15 minutes with us at each of our dinners (granted we ordered tequila flights, but were not huge spenders). The other servers throughout our visit at all locations were good. Poolside service was understaffed. One day at the pool there was only one server for the entire pool; and I would guess there was 40-50 people sitting poolside. Everyone was quite friendly. It was not Four Seasons level service but it was comparable to other top tier properties. My only recommendation would be to monitor the division of the staff and potentially do a recalibration of where staff are needed. 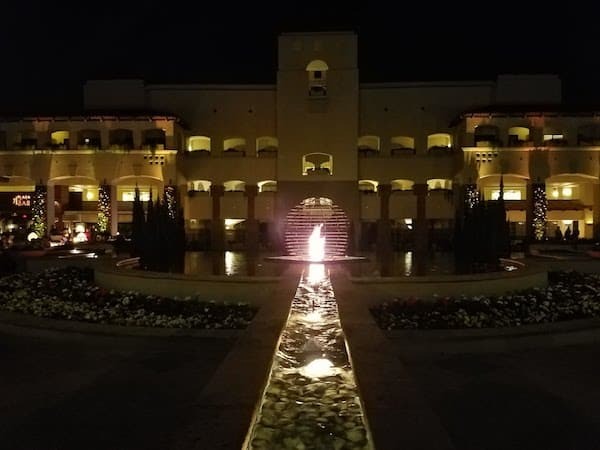 The Fairmont Scottsdale Princess is a huge resort. 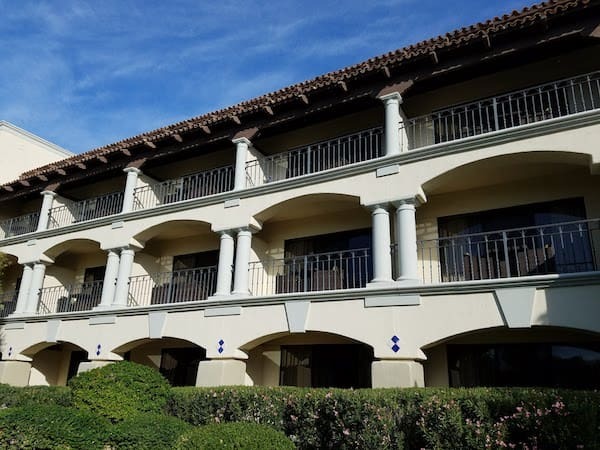 Staying in the Casitas made the property feel more intimate and manageable; almost like a resort within the resort. There is plenty to do and eat on site though it comes at a cost. The service could be improved — all staff seemed very well trained but might need better management of resources. My biggest gripe is with their double resort fee. If you are going to charge a resort fee, then do not also charge a spa fee. I hate resort fees; I find them completely dishonest. But to charge a daily spa fee on top of it is ridiculous to me. 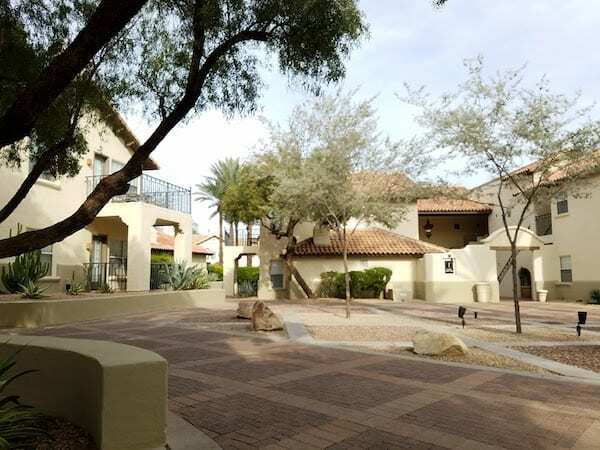 The positives of our stay outweigh that annoyance; and I would definitely consider it for a future stay in the Phoenix area.